A child's faculty to process sound has a deep impact on his ability to understand, communicate and develop. Normal hearing is vital for developing an optimum aural and oral communication. Hearing loss in infants and children has been implicated in deficits of speech and language acquisition. The National Healthcare Study, United Kingdom, reports that deafness is a very severe problem, with 14 per 1,000 adults worldwide are severe or profoundly deaf. As reported by World Health Organization, there are about 250-300 million deaf people in this world, 2/3 of them live in the underdeveloped nations, of these India has the largest share. At least one Indian in 12 suffers from hearing loss with 25,000 children are born deaf every year in India. Many guesstimate that the prevalence is of about three million deaf children, out of which only one in ten deaf children go to school. Fifty per cent of deaf children in school drop out at the age of 13. Recent figures suggest that in India, 63 million people (6.3%) suffer from significant auditory loss. Without appropriate opportunities to learn language, children who have some hearing impairment fall behind their peers in language, cognition and social-emotional development. Such delays may result in lower educational and employment levels in adulthood. Early identification and intervention improves severe linguistic and communication delays and also minimizes the need for extensive habilitation during the school years. We performed a study on hearing-impaired children in local special schools to see the impact of early rehabilitation for a period of two years (2007-2009). 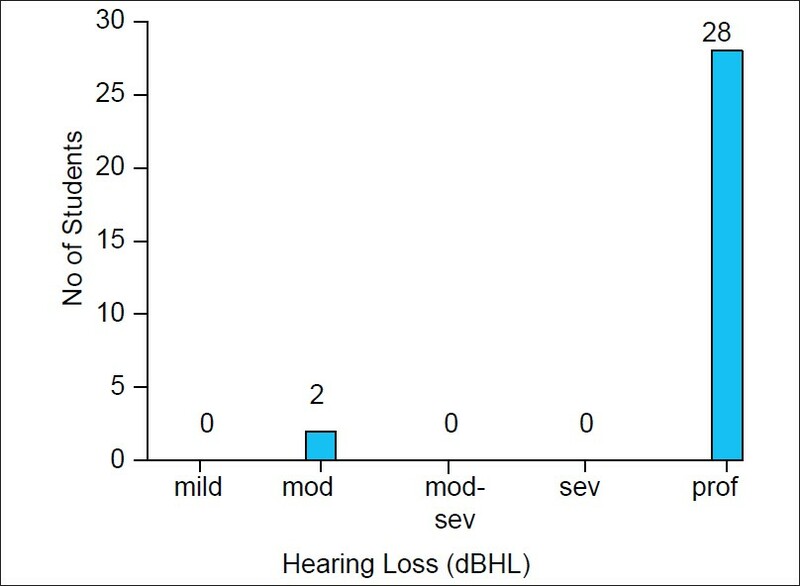 This cross sectional study was carried out in two separate areas, with a total sample size of 111 children with hearing impairment, the first in Amar Ashram school for the physically and mentally challenged, Patiala, Punjab, India in 2007 and the second in Special School for the deaf, Sichey, Gangtok, Sikkim, India in 2009. The ethical permission to conduct the studies was taken from the respective institutes. All the caregivers of the patients were explained about the purpose of the study and were ensured strict confidentiality. Written informed consents were taken from each of the caregivers of the children prior to the study. A detailed history including prenatal and perinatal events, developmental milestones and available hospital or school records was recorded. Systemic and local Ear-Nose-Throat (ENT) examination was done along with detailed audiological assessment by Pure Tone Audiometry and other objective tests like BERA (Brainstem Evoked Response Audiometry) wherever necessary. Information on impact of hearing impairment in children and the benefit of early intervention was disseminated in health education sessions to complement the findings of study. The data collected was entered into Microsoft-Excel spread sheets, and analysis was carried out. Percentages and Fisher's exact test were used in this study to analyze epidemiological variables. In Patiala, Punjab, 81 deaf-mute children up to 18 years of age at a local special school were studied. 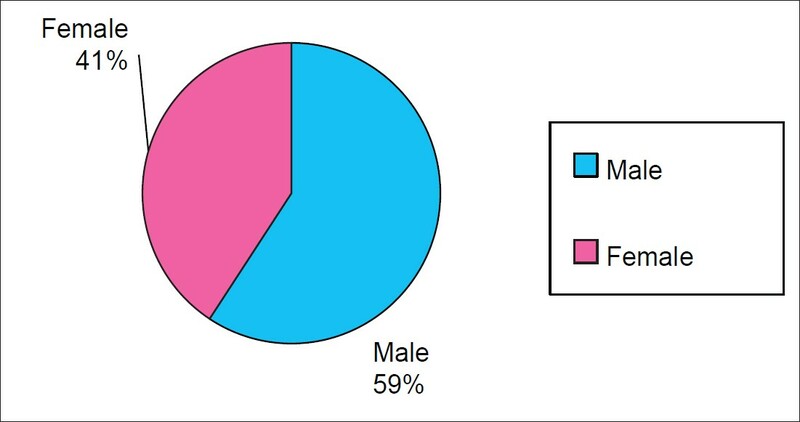 Most children were >6 years of age at the time of initial presentation [Figure 1] and there was a male preponderance [Figure 2]. Age of presentation at school was usually after six years of age [Figure 3] which was also the age of commencing hearing aid usage and most (75%) belonged to below poverty line families. The Hearing was assessed using Elkon Diagnostic audiometer (Eda 3n3 Plus) at the pure tone frequencies 250, 500, 1000, 2000, 4000 and 8000 Hz. 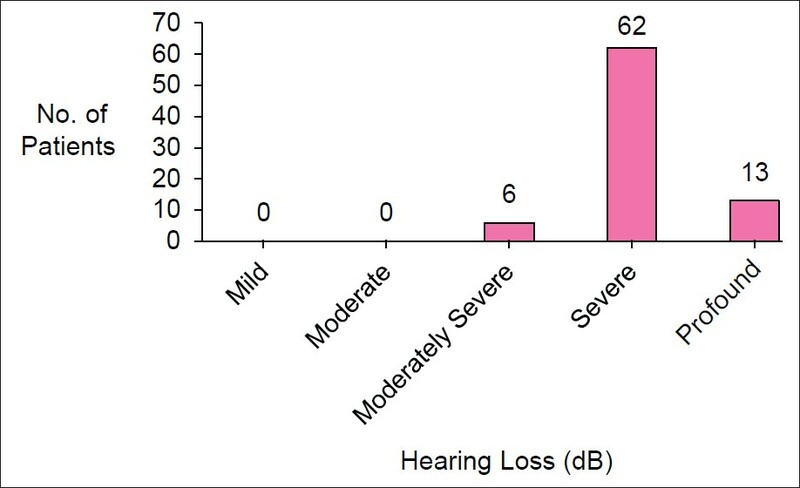 Most cases had severe hearing loss (76.5%) [Figure 4]. Aetiological / Risk factors were studied based on history, hospital and school records. Majority of the cases were found to be of idiopathic origin (21%) followed by those due to intrauterine infection (17%) [Table 1]. The impact of early intervention, rehabilitation and hearing aid use was studied by comparing the communication ability, literacy and educational level improvement since the time of admission into the school as graded by the teachers using SIFTER (Screening Identification For Targeting Educational Risk) scoring. Impact was better in early presentation. Out of 33, those presented in age less than six years, 23 (70%) had a mild to moderate improvement. Out of 48, those presented after six years, only 21 (43%) had some improvement [Figure 5]. This similar survey was also conducted on 30 children up to age of 16 years at Special School in Gangtok. 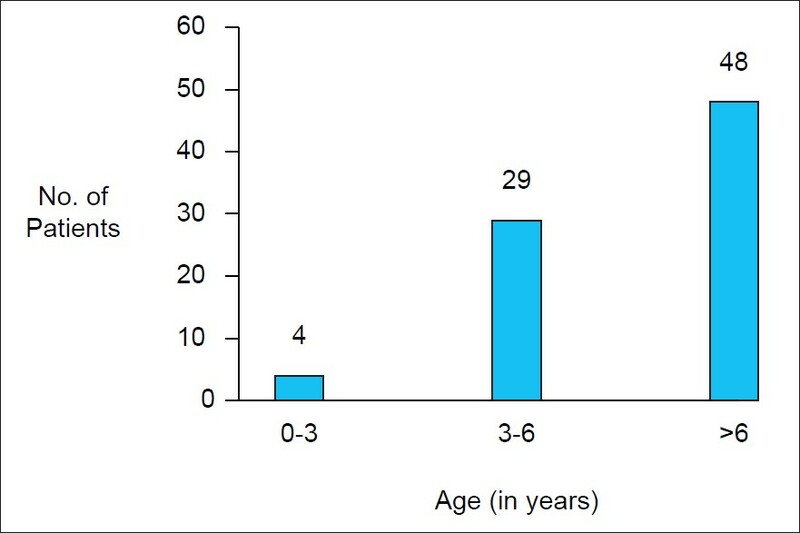 Most children were above six years of age [Figure 6]. 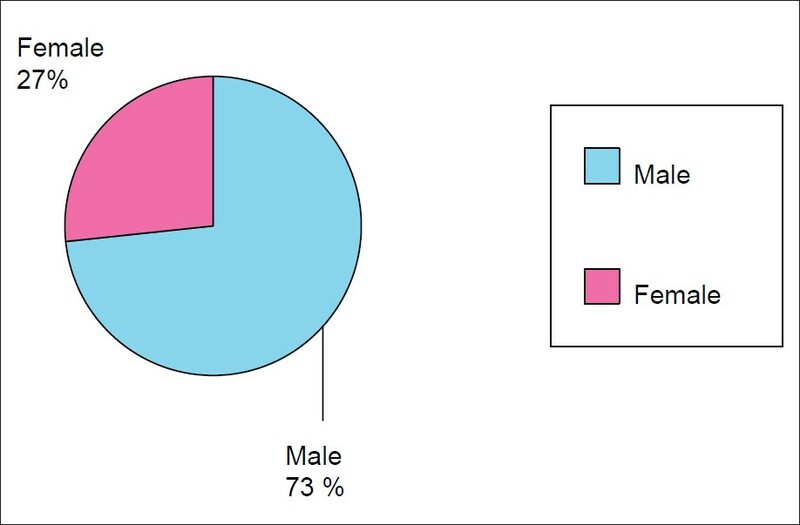 Most children were male (73%) [Figure 7] and all were from a poor socio-economic status. Age of enrollment in school was five years for all children, as per government policy [Figure 8]. It was also noticed that all the children did not use any type of amplification till their admission. Audiometric examinations were carried out in an audiometric two-room suite using a clinical diagnostic audiometer (GSI-61). Air conduction and bone conduction thresholds were obtained for the frequencies 250Hz to 8000Hz. 80% of children were found to have profound sensorineural hearing loss and 20% fell in moderate range [Figure 9]. The study of causative factors leading to deafness based on history, hospital and school records showed that most cases were due to birth asphyxia (27%) followed by idiopathic causes (23%) [Table 2]. 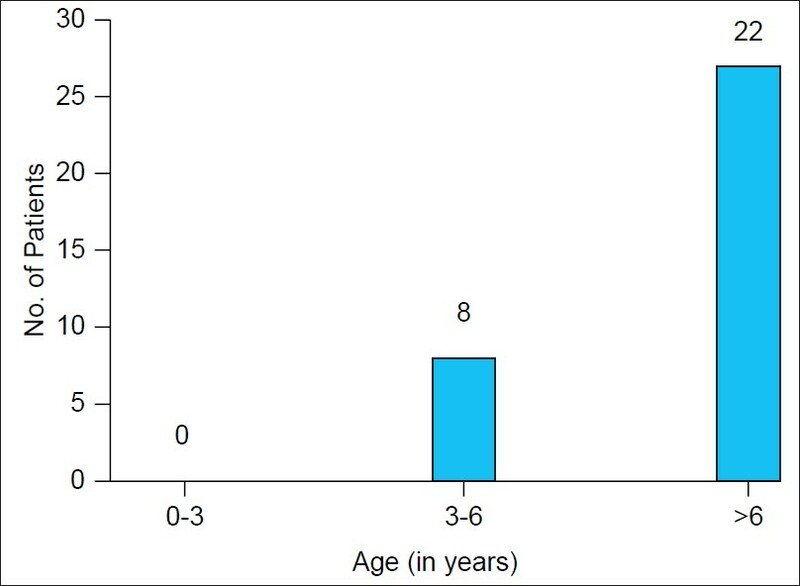 Children who receive early access to amplification and intervention at the age range of 5-6 years were found to have good speech skills and academic achievement compare to those detected at later age, found out by comparing the communication ability, literacy and educational level improvement from the time of presentation to the school as graded by the teachers using SIFTER scoring [Figure 10]. Out of eight, who presented before the age of six years, six students were found to have good speech skills and academic achievement. Amongst them, two were also integrated to normal school after three years of rehabilitation. Out of 22 who were presented after six years of age, 10 were found to have mild - moderate academic performance and auditory and speech skills. Remainders were found to have poor speech skills. Four students had no acceptance of the hearing aid and were using sign language to communicate. Their age of presentation to the school was above the age of 12 years. Nevertheless, early intervention by six months of age helps a child with hearing deficit to develop a normal speech and language. Research comparing children with hearing loss who receive early intervention and amplification before six months of age versus after six months of age, shows that by the time they enter first grade, children identified earlier are 1-2 years ahead of their later-identified peers in language, cognitive and social skills. However, this does not mean that subsequent intervention is not beneficial. The sensitive period for language is from seven months in utero up to 5.5 to 6 years of age, which includes the several aspects of language from spoken language, to written language and reading. Thus, if hearing loss is detected early; the consequent negative impacts can be diminished and even eliminated through early intervention. Most children who are born with a hearing loss can be diagnosed through a hearing screening. Hearing screening for newborn, before they leave the hospital, is becoming a must in most developing countries. Without such program, average age of detection of significant hearing loss is approximately 14 months. Most recommendations for early hearing detection and intervention (EHDI) include universal screening by one month of age, detection before three months, and appropriate intervention no later than six months. Such screening tests provide a quick, cost effective and reliable way to separate people into a pass group and a fail group, guiding further management. Those who pass hearing screenings are presumed to have no hearing loss. Those who fail undergo a detailed evaluation by an audiologist and may need further follow up and intervention. Screening procedures for newborn and infants detects permanent or fluctuating, bilateral or unilateral and sensory or conductive hearing loss, averaging 30-40 dB or more in the frequencies important for speech recognition (approximately 500 Hz-4 KHz). The screening of newborns and infants involves use of non-invasive, automated, objective physiologic measures that include Auditory Brainstem Response (ABR) and/or Oto-acoustic emission (OAE). Infants not tested as newborns should be screened before three months of age. Other infants should be screened who received neonatal intensive care or special care or who display other indicators that place them at risk for hearing loss. Older infants and toddlers with greater chance of hearing loss because of certain risk factors such as neonatal meningitis, maternal TORCH infection, neonatal hyperbilirubinemia to name a few, should also be screened. This screening should be done even if an initial hearing screening is passed because in some cases the hearing loss manifests later. These children should be monitored at least every six months until three years of age, and at regular intervals thereafter depending upon the risk factors. Screening procedures to detect hearing impairment that exceeds 20-30dBHL are applicable to this age group. Two screening methods which are considered most appropriate for children at a developmental age of seven months to three years are Visual reinforcement audiometry (VRA) and Conditioned Play audiometry (CPA). Both these methods are behavioral techniques requiring involvement and cooperation of the child. Alternative procedures, such as OAE and/or BERA are used if the child is unable to be conditioned. In case of preschoolers, CPA is commonly used procedure. In addition because hearing loss in this age ranges is commonly associated with Middle ear diseases, Acoustic Immittance screening (Tympanometry, Acoustic Reflex) are also recommended. School-age children should be screened for hearing loss as needed, requested, mandated, or when conditions place them at risk for hearing disability. Exposure to loud music, which is common in older children and teens, further potentiates the problems. Upon entering a new school system without evidence of having passed a previous hearing screening. It is absolutely necessary that hearing loss is detected at an early age and amplification to be introduced as early as possible once there has been a diagnosis of a hearing loss capable of having an impact on speech and language development. It cannot be over stressed that if detected late, hearing impaired children are more likely to perform below their grade level, and are more likely to be held back, drop out of school, and even fail to earn a high school certificate. These consequences are in sharp contrast to those for children who are identified early, receive early intervention, and then are found to function at the level of their peers by the time they enter school. When early identification and intervention occurs, hearing impaired children make dramatic progress, are more successful in school, and become more productive members of society. The campaign needs to be started in all cities and villages in India. EHDI, if coordinated under the national immunization plans for India, will ensure better outreach of the program. A well- planned program goes beyond initial hearing screening with consideration of re-screening, threshold audiometry, and referral for audiological and medical management, education and counseling for parents and teachers, integration into schools with improved tutorial support to name a few. Appropriate stress on EDHI is also lacking in the undergraduate and postgraduate training programs of the health care givers, a situation that can be easily remedied. A joint effort of the Ministries of Health, Family Welfare and Education, both at the Central and State level is required. Without concurrent follow-up program, identification of hearing loss in children is a meaningless effort. 1. American Speech-Language-Hearing Association. Guidelines for the Audiologic Assessment of Children from Birth to 5 Years of Age [Guidelines] 2004. Available from: http://www.asha.org/policy. doi:10.1044/policy.GL2004-00002. [retrieved on 2010 May 1]. 2. Apuzzo ML, Yoshinaga-Itano C. Early identification of infants with significant hearing loss and the Minnesota Child Development Inventory. Semin Hearing 1995;16:124-37. 3. International Deaf Children's Society - Welcome to IDCS Updates: Facts about India, idcs.info v 4_3. Available from: http://www.idcs.info/incountry_programmes/india/facts_about_india/facts-about.html. [retrieved 2010 Apr 22]. 4. Garg S, Chadha S, Malhotra S, Agarwal AK. Deafness: Burden, prevention and control in India. Natl Med J India 2009;22:79-81. 5. Screening Identification For Targeting Educational Risk. In children identified by hearing screening or who have known hearing loss by Karen L. Anderson, Ph.D. User's Manual. Available from: http://www.kandersonaudconsulting.com/uploads/SIFTER_Manual.pdf. [retrieved on 2010 Oct 22]. 6. Fisher's exact test. Available from: http://www.graphpad.com/quickcalcs/contingency1.cfm. [retrieved on 2010 Oct 22]. 7. Yoshinaga-Itano C, Coulter D, Thomson V. The Colorado newborn hearing screening project: Effects on speech and language development for children with hearing loss. J Perinatol Suppl 2000;8:S132-7. 8. Bess F, Dodd-Murphy J, Parker R. Children with minimal sensorineural hearing loss: Prevalence, educational performance, and functional status. Ear Hearing 1998;19:339-54. 9. Sensitive Period for Language (birth to 6 years). 2008. Available from: http://www.dailymontessori.com/sensitive-periods/sensitive-period-for-language/. [retrieved on 2010 May 30]. 10. White L, White RE. The effects of hearing status of the family and age of intervention on receptive and expressive oral language skills in hearing-impaired infants. ASHA Monogram 1987;26:9-24. 11. Robinshaw HM. Early intervention for hearing impairment: Identifying and measuring differences in the timing of communication and language development. Br J Audiol 1995;29:315-34. 12. American Speech-Hearing-Language Association; Information for the Public; Hearing Screening. Available from: http://www.asha.org/public/hearing/testing/default.htm. [retrieved on 2010 Mar 31]. 13. Project Deaf India; Souvenir article at the Key note address given to Ahmedabad District Rotary 3050 annual conference. Available from: http://www.projectdeafindia.org/ProjectHistory/PreventionofDeafness/tabid/80/Default.aspx. [retrieved 2010 Mar 30].